Switchfoot wasted no time in rocking a capacity crowd in Chicago by opening with their hit "Stars" in a show that left audience members shredded, but wanting more. The San Diego based band, now in its tenth year of creating transcendental rock and roll embraces their faith while living the rock star life. 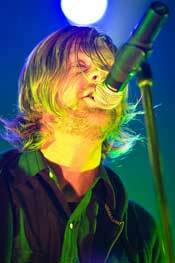 Jon Foreman (lead singer) brings influences like U2, The Police, The Beatles and Nirvana to the stage in a progression beyond the "Christian band" label. The band aspires to be viewed as faithful individuals and not as a genre of music. The current tour started as an 8 city mission to thank their fans for continued support and to expose them to some new material. Consequently, because of the fan demand, they're in the midst of a 30 city tour with many dates selling out. The band is keeping the set list free flowing and plays a modified version every night. During the 18 song set in Chicago they inserted four new tracks from their current release "Oh! Gravity" including, "Dirty Second Hands" (the band's current favorite) and the phenomenal "Awakening." The band is well known for its reaching out to fans with their lyrics and with their physical interaction. During "Happy Is A Yuppie Word," Jon climbed over the barricade and went out into the audience. He kept on singing and eventually ended up in the balcony to serenade the rest of the band still performing on stage. Then there was the fan, known only as 'Face', who was hoisted up to the stage after shouting a request for the song, "Company Car." 'Face' chilled with the band while they rocked the rest of the room. Jon donned a mullet wig that he received for his birthday during the song, "In honor of 80's" while posing for pictures for the lucky fan. The wig was a continuation of the band's current 'scruffy look.' Several members of the band are in the midst of a 'who can grow the strangest mustache contest' on this tour. It's a three way tie between Jon, Drew Shirley (guitar) and Chad Butler (drums) while Tim Foreman (bass and backing vocals) and Jerome Fontamillas (guitar, keyboard, and backing vocals) don't seem to be competing. Another special treat from the band was the live debut of the song "Let Your Love Be Strong" in honor of the Chicago crowd. The audience was ecstatic the whole concert and at several instances took over singing the lyrics while interjecting hand claps and screams. It was a true testament of a well-loved band giving love back to their fans in what is going to be an exciting tour. "The Shadow Proves The Sunshine"
"Let Your Love Be Strong"